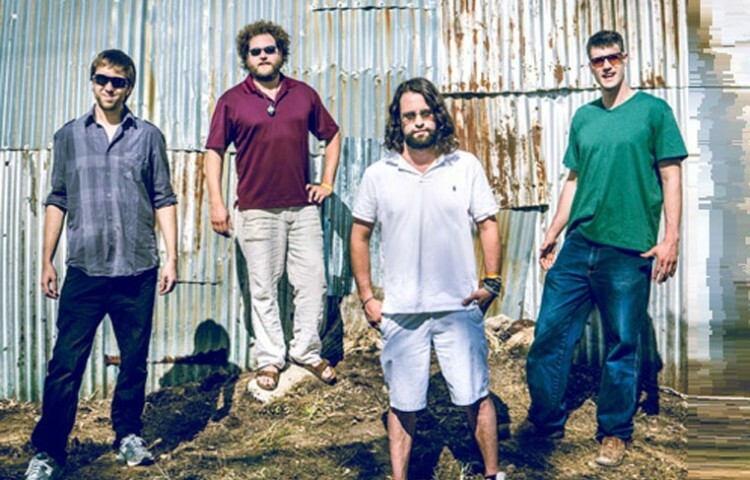 Known for their improvisation and dynamic live shows, the group first gained prominence in mid-2011 when they reached the number two top searched artist on the leading online Jam Magazine, jambase.com, and again in early 2012 when they hit number one. The foursome has since appeared at major festivals and events across the U.S. and abroad, even starting their own entitled “The Werk Out Music and Arts Festival” in 2010. We caught up with the band behind scenes at North Coast Music Festival, discussing their erratic songwriting process, love-hate relationship and newfound love for doing absolutely nothing. Okay so first of all, tell me a little about how you guys met and how The Werks first came together. Dino: Norman and me are brothers, so we were forced to meet at birth. Rob: Me and Houser started The Werks back in 2005 or 2006. Chris: The original band started because I had a band called Cheesecake—it was a three-piece, bass, drums and guitar—and our drummer was moving to Florida, and I’d recently met Rob who was losing his bassist and guitar player. So it just worked out. As time moved on our original keyboardist moved to Maine and got married—that’s when we picked up Norman, it was 2008. Then Dino had another child—that was his second child—so touring wasn’t the best for him so he left the band, and then came back in about two years ago. So that’s how we came to be the Werks as we are now. Rob: Long story short, we formed from a lot of different bands into one. Dino: We took the best of the best and we put them all together to become the worst. So what’s made you stick together? Chris: It’s a mutual hatred for all of us. Each one of us hates each other so much that we’re trying to play ourselves to death. But we’re still alive, and we’re still having fun with what we’re doing. You guys do tour all the time together. What’s it like spending that much time with the same group of people? Rob: Have you ever been to jail before? Dino: That’s a good analogy. Dino: Basically it grows on you. It’s terrible but eventually you get used to it and you like the terribleness of it, and then when you’re not on tour you even kind of miss it. Dino: No, no. I mean, I think there’s eight or nine of us who travel together all the time with crew and staff and everything. Norman: Say you had eight or nine people living in an apartment and you weren’t getting along. That’s in an apartment—you can actually leave. You can’t just walk out the door doing 65 mph down the highway. You’re largely recognized for your ability to jump across genres. How do you balance the different sounds? Dino: I think the big thing for all of us is that even though we have our own appreciation for what we think is great music and what influenced us, we all have a great appreciation for music in general. There’s a lot of bands out there that are afraid to go this direction or that direction or play this song, but for us there’s really no constriction. Chris: We go every direction. Dino: We just have no restrictions to what we’ll play, and I think that’s why we bridge so many genres because it’s just that fearless attitude. There’s nothing out there that we can’t do and there’s nothing out there that we don’t appreciate to the point where we wouldn’t play it ourselves. It’s kind of The Werks name in general, you know? It’s about a little bit of everything. You get something with “the works,” it’s got everything. I think that name fits us really well. A lot of your sound is improvisatory. What is your songwriting process like? Norman: Oh man, it’s weird. We’ll go from somebody writing a song to somebody writing a lick and everybody joining in to somebody coming up with an idea years later. Dino: I think the cool thing about our songwriting ability is that we take every aspect of what we do on it. Someone will come up with a song and we will respect their songwriting ability to the point where we try to create their vision and really see their vision through. And then a lot of the other songs get written where we’ll just be playing as a band and a lick will come out or a groove will come out and we’ll kind of work on it together. There’s three or four different ways that we’ll bring a song to the table, and you can’t really say which one’s better or which one’s worst because a lot of great songs came out of each way that we write them. So we just try to be open minded. You say your performance is largely affected by the energy of the audience. What kind of things do you respond to? Dino: I think part of our popularity and why people seek us out for our live shows a lot is because there’s a lot of energy and interaction with the crowd. We feed off the crowd; the crowd feeds off us. It’s like a vicious circle of energy. Norman: The better the crowd is, usually the better we sound. If the crowd can really get down, it pushes us to get down even harder. Dino: The unique thing about or shows is that no show is the same and no song is the same. We try to push the envelope every time we get up on stage, and a lot of it has to do with how the crowd is reacting. If a crowd’s really feeling a certain style then we try to morph in to that style and push that style a little more. We have fans that will run with us for about three or four days in a row because they know they’re gonna get a different show every night, they’re gonna get a different experience every night. Rob: We kind of ripped out a page from the Grateful Dead/Phish mentality when it comes to shows. So do you have a plan going into a show or do you mostly wing it? Dino: Yeah, we have a plan, but we don’t really stick to it. Chris: There’s nothing wrong with coloring outside the lines. Norman: The plan is to have a plan that’s not a plan. You guys have played at all sorts of music festivals. What’s a good festival experience for you? Dino: What makes any festival is the people, the crowd. Dino: A lot of the really good festivals are really good because they create a good environment and a good core of people come. You always get riff raff anywhere you go, but for the most part the majority of the people that come to these festivals are very open minded, they take in what you’re putting out there, they like you to take risks and they like to see something different. That’s what I think makes festival season so special. You’re reaching a large group of people who are very open minded to the style that you’re putting out there. Rob: And I think the one thing they all have in common is that they appreciate music and appreciate the musicianship. It doesn’t matter if they’re a funk person or a jam person or an electronic person or what have you, it’s the fact that they’re at the festival to appreciate all of it. That’s the people we try to aim for anyway. Chris: Festival season for us is a great opportunity to reach an audience that would not normally know about us. It’s getting more ears on our music and spreading the word. Dino: Really, for us, it opens the door to finding a new audience. Is that why you started your own festival? Dino: Basically the reason Werk Out exists is that we have so many friends in bands and we see each other at festivals and at shows and stuff, and we thought it would be really cool to just handpick our bands and bring our friends to one spot where we can all hang out. And then the fans from Ohio and the fans from across the country can all come to one spot and celebrate once a year. It’s kind of like a family reunion—we all get together and catch up. Chris: The bands we pick to come are bands we’ve played with on the road nowhere near Ohio. Typically Ohio is a tough market, so the bands that we’ve picked to come are also very excited to play in Ohio. Dino: It’s great exposure for them. It seems like you’re constantly touring. What’s your favorite thing to do when you get back home? Rob: Do nothing. I never thought I’d actually appreciate doing nothing, and it’s actually one of my favorite things to do now. Dino: There’s a line from “Office Space” that I always say when we’re in town and they call. They’re like, “Dino, what are you doing today?” And I say, “I did nothing, and it was everything I thought it could be.” But of course we practice and do everything too. There’s no rest for the wicked. Dino: We have a new album that we’ve almost finished up. We need to get it wrapped up shortly after Werk Out, hopefully get it out by the end of the year, if not early next year. We have a big fall tour that’s taking us pretty much everywhere.